Do you need a rail load out and receiving system that provides the greatest speed, accuracy, efficiency, and maximizes profits from your bulk weighing operation? Don’t miss out on every opportunity to enhance profits! The CD-4000 offers significant advantages, including accuracy to within one bushel per rail car, full color graphics and automatic scale diagnostics. You will eliminate fines and ensure maximum profits by loading to the legal limit allowed. The CD-4000 is designed to handle all types of bulk weighing applications including inbound and outbound transactions for rail, truck, barge and ship and has the following advantages over any other controller on the market. Powerful User Interface: All operator actions are easy to understand and use, accomplished by using simple function keys. All scale operations displayed with full color graphics and are handled from one ‘window’ including preparing data and running the scale. Fast: The CD-4000 is the fastest controller on the market. This means you can do the work in less time by using fewer drafts. The CD-4000 calculates the flow rate 60 times a second and selects gate closing time to an accuracy of 1/10,000th of a second so that the weigh hopper can be safely filled to a higher level on each draft than any other controller. Accurate: When you ask for 198,500 lbs. in a railcar that’s what you’ll get. We are able to load to within one bushel without any slow down in speed. Smart: CompuWeigh’s SmartTech feature automatically diagnoses scale problems and shows the operator what the problem is, where the problem is and how to fix it – even at 2:00 am in the morning. Choose CD-4000 When You Need The Best. CompuWeigh Adds More Intelligence: Because CompuWeigh monitors every aspect of the weighing operation, if you overshoot on one draft GMS automatically corrects it on the next draft. This process repeats itself over time and will also compensate for slower gate performance at the start of the day. Also, easy integration is available to all major PLCs using the industry standard Modbus protocol, reducing cost of integrating scales with automation systems. And, the CD-4000 is the foundation of a modular system so you may add other efficiency enhancing features with the addition of our grain management system GMS-4000. 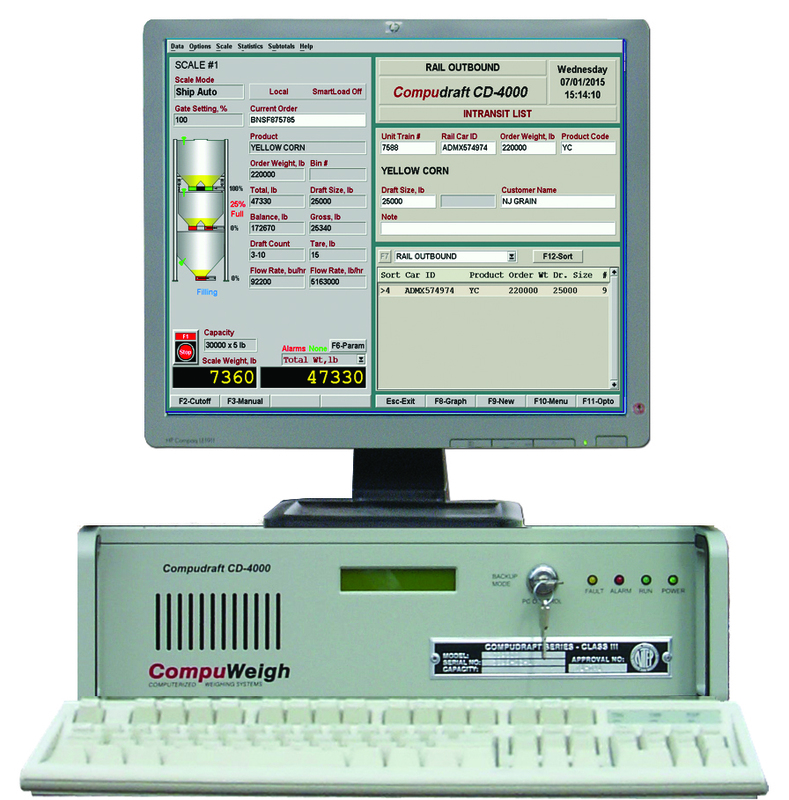 CompuWeigh’s Industrial CD-4000 Controller is a specially designed workhorse for harsh environments and is a part of the Compudraft Series of controllers that weigh over 50% of all the grain weighed in the U.S. Each unit has a single-board microcomputer with a heavy-duty power supply and is mounted in an industrial steel enclosure. The controller has no moving parts except for the key switch on the front panel that allows the monitor to work with either the CompuWeigh Industrial CD-4000 Controller (normal or back-up mode) or with the GMS-4000 Industrial Data Management Computer (advanced operations mode). The CD-4000 power is built upon a single board microcomputer, heavy-duty power supply and status panel, mounted in an industrial steel enclosure that can be used either as a tabletop model or in a standard 19″ rack-mount with optional hardware. The Controller has four serial ports that handle communications to the digital weight indicator, printers, PLC and our GMS-4000 System.